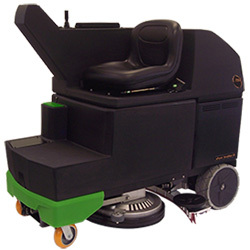 NSS’s eForce Scrubber breaks with tradition and delivers an easy to use, easy to operate rider scrubber that’s unlike anything you have seen before. Climb on the seat and point the joystick where you want to go. With no effort whatsoever, the eForce Scrubber takes you there. And, tight turns are no problem for the eForce Scrubber. It can turn on a dime thanks to its unique joystick control.